Australians might be used to receiving toys with kid’s meals, but a new food trend is emerging out of the United States; food companies expanding into high-end merchandise. As highlighted by MarketingDIVE, a number of American food companies have been venturing into design-driven merchandise recently, with Kellogg’s Fruit Loops the latest to join in. 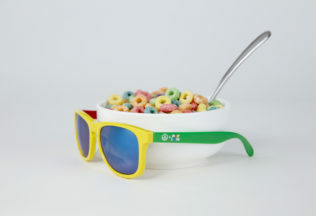 Late last week, Fruit Loops launched a range of colourful sunglasses with Neff Headwear. Later in 2017, Fruit Loops will also collaborate with a bicycle company and a bag company. Other US food companies which have expanded into fancier merchandise recently include Cheeto’s chips and Mondelez International’s Oreo cookie. Although many food companies have distributed cheap or free promotional merchandise for years, MarketingDIVE writes that the move into unique and limited-edition merchandising helps build brand excitement among younger consumers, along with providing media attention. It is also written that when sold online, the merchandise gives food companies the chance to gather data about those who buy their products. Fancier merchandise is a trend Australian food companies have dabbled in with McDonald’s Australia selling a range of limited-edition pajamas in 2016.